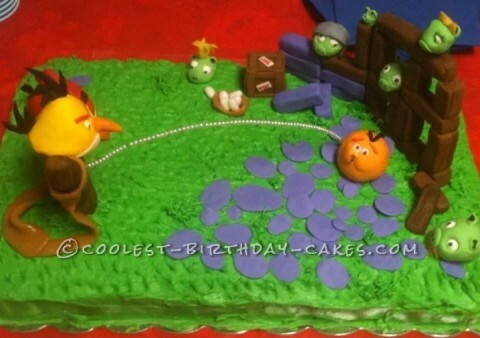 For the ‘Angry’ Birds… is a 10th birthday cake I made for my granddaughter. I love baking for family. I love the big smiles and wide eyes the first time they see their special cake, but most of all I love the hugs that follow! My grandchildren are my world and they challenge me… keep my adrenaline flowing… keep me excited about life. So, every year I can’t wait to see what they have for me to tackle next. This cake was no exception. My granddaughter told me which birds to use and I hand-shaped fondant for them, as well as all the blocks, pebbles, slingshot and pigs. The leather sling is made of caramel. The bubbles blowing up the orange bird is made of pearl beads strung on a wire. My granddaughter was very excited… and I was hugged!!! !